Hike the Catskill's High Peaks region with a Forest Ranger by your side! Book Two: The Central Catskills includes hikes through the rugged wilderness terrain of the heart of the Catskill Forest Preserve, taking you to the summit of the highest peak in the Catskill Mountains, the massive cliffs of Giant Ledge with its panoramic views and dizzying heights, through the Burroughs Range made famous by America's first literary naturalist, to the geologic mystery of the Panther Mountain Circle and the splendors of a sunset over the peaceful Ashokan Reservoir. 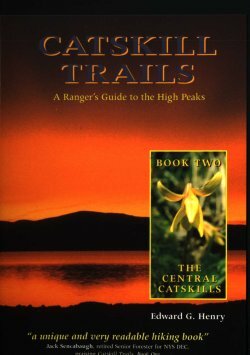 Catskill Trails offers rewarding hikes for every level of ability: Mount Tremper , Overlook, Ashokan High Point, Slide, Giant Ledge, Panther, Cornell, Wittenberg, Belleayre, Balsam, Haynes & Eagle, Big Indian, Peekamoose, Table Mountain, Dry Brook Ridge, Balsam Lake, Doubletop, plus the trail-less High Peaks . Edward G. Henry, a conservation professional, draws the latest information from geology, forest ecology, meteorology, wildlife biology, geography, economics, and history to offer a well-rounded picture of the Catskill Mountains, helping the reader to experience the hikes and see the Catskills as "a natural historian, not a tourist," and to see "not just the present, but the past as well ... and maybe even the future." Ed Henry has written a unique and very readable hiking book. Its uniqueness, its difference from other such books, lies in its strong emphasis on the geology of the mountains, the description of forest vegetation and how it changes as the hikes progress, and the almost poetic invocation of scenes along the way.